Built by the famed Graziadio Antegnati in 1565 to the instructions of Girolamo Cavazzoni, the Court organist, originally the organ had nine ripieno stops, two flutes and fiffaro, the usual arrangement for the most important organs of the time in the Po Valley region. 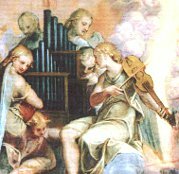 However, this particular church organ was required to meet the demanding needs of the Patron: beyond the mi re ut, the "gionta spagnola" which extended the keyboard to the C 16’, and was especially rich in split keys. The division of certain chromatic keys into two elements, one on top of the other, enabled the customary sixteenth and seventeenth century limits of meantone temperament to be exceeded, providing precious notes for perfect harmony in the most daring modulations and, especially, for the transposition of vocal music. It was undoubtedly Cavazzoni who wanted a keyboard with split keys at the notes d#/eb and g#/ab; it was not easy but in the end the organ was delivered “so good that nothing better could be asked for”. The organ needed to be cleaned after just five years due to work on enlarging the church; two significant maintenance jobs were carried out at the end of the sixteenth century and in 1624. 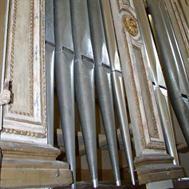 In 1692 the organ was still considered in excellent condition. Its decline began in the first decades of the eighteenth century; after that, continual repairs and some quite severe tampering on at least two occasions reduced the organ to a pitiful relic. Numerous projects were discussed to renovate the instrument but nothing came of them until after the original spring-chest, action and pipe-rack were recovered, certainly one of the most important events in the field of historical church organs of recent years. The precious phonic material, albeit altered over time, is sufficient to give a good idea of the original organ; no significant alterations in the eighteenth or nineteenth centuries have survived, hence the complete renovation of the seventeenth century organ – the most legible of all its versions - was possible. 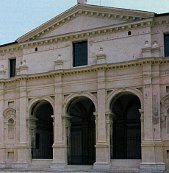 The fact that the Basilica di Santa Barbara in Mantova has been given back its church organ is a musical event of enormous importance. * Built by Graziadio Antegnati in 1565. The organ is located in an area of brickwork closed off by a wooden partition. The choir is made of wood and is located above the smaller chapel, in cornu Epistulae, before the presbytery. Eighteenth century choir and front according to the original design and with some original decorative elements. Two doors in the form of large painted canvases, depicting S. Barbara and S. Pietro when closed and the Annunciation when open, protect the front. Thought to be by Fermo Ghisoni. Façade in fine tin, with 15 pipes in 3 divisions of 5 pipes, in apex form, starting with the F1 12’. Keyboard with 57 notes extending from C1 to F5 with short octave and 7 split keys, rebuilt to the original model conserved in Almenno S. Salvatore. Short pedalboard Italian style, 18 keys, short octave, constantly coupled to the keyboard. Stops moved by 12 levers with Lombardy-style grooves in walnut, ordered in one column on the right of the console, rebuilt to the original design. There are 312 pipes made by Antegnati or his workshop and a total of 656 holes in the spring-chest. Original wind spring-chest, Lombard Renaissance, entirely in walnut, including windbox floor, with 12 stop beams and 57 channels, fir pallets. Pipe-rack in leather modeled on the original, now in a museum after conservation work. 4 wedge-bellows in a rear room, with original wind conduit, operated by hand, blower or automatic inflating unit. Pitch: 466 Hz on 20 °C and 61 % di U.R. at A5 of Principale 16'. Damiano Rossi, Chairman and Director of Works, Diego Morato (architect) representing the Department of the Cultural and Architectural Heritage of Brescia, Mantova and Cremona, Prof. Flavio Dassenno, Umberto Forni consultant and expert organist, Dr. Licia Mari, archive researcher. "Messer Graciadio provided the entire organ, with 12 stops. There remain the diexis scavezzi, pipes of the same number which are not satisfactory in his opinion or in mine. But the Principal stops are in good order. This is of little importance and he promises to make them in Brescia and in September to return with these diexis... the organ was so good that nothing better could be asked for and it seems in this church there is always jubilation and the people come for this reason…"
"Remove the two lateral additions… to the spring-chest, which have never been satisfactory, damaging the balance of the harmony… and return it to its original state… using the old spring-chest which is excellent, better than new… and if it were not in such good condition the organ could not have been used so often without a stroke of work being done…"
The instrument survived albeit in a pitiable state, for 430 years of cleaning, maintenance, modification and tampering of all sorts. 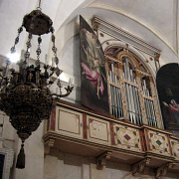 The materials used to make the organ had exceptional features and were the oldest in the Graziadio workshop, making the pipe organ in Santa Barbara unique even among the few made by Antegnati still extant. The historical and artistic value of the instrument is inestimable and the recovery of the original parts and consequent renovation of the organ was the starting point for the restoration of the entire Church. The organ was commissioned from the most important member of a dynasty of organ makers from Brescia, famous for its Po Valley Renaissance designs, as work on the first version of the church was being completed. It was valued at 600 scudi and had the exceptional feature of a keyboard with split keys. Seven black keys were split into two distinct sounds, providing a huge range of new musical possibilities: chromatic alterations and "durezze e ligature" tuned according to meantone temperament. The dissonances were cruder than today, but the effect was deliberate and carefully kept under control, to bring out the contrast between light and dark, movement and stasis, a characteristic of the Renaissance and proto-baroque styles. The degradation of the organ was severe, due to use for over four hundred years and the exposure, during the first thirty-five years, to dust and large particles from the work being carried out in the church. The organ needed continual repairs and retuning, as in 1570 when Costanzo Antegnati, the 20-year old son of Graziadio, worked on the instrument, to be followed by Bernardino Virchi at the end of the century and Tomaso Meiarini in 1624. Some work, perhaps by Giovanni Fedrigotti in 1718, by the Mantovan Andrea Montesanti in 1759 and one Giuseppe Antonini in 1804, as well as a great deal of tampering, made the instrument a palimpsest, written and rewritten continuously, whose original message was difficult to decipher, although the organ never became unrecognizable. The preliminary studies and archive research took four specialists a year and a half for the meticulous archaeological reconstruction of the original organ, a rare approach for Italy. 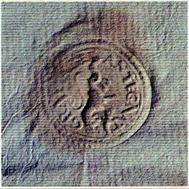 The restoration work was given the full support of the research team, which made every scrap of information found available. The organ was researched down to the finest detail, peeling away subsequent modifications to reconstruct the organ as it had originally been built. The restoration work took twelve long years due to the lengthy process of renovating the Church itself. The highly experienced organ specialist Giorgio Carli of Pescantina restored the organ with extraordinary care and precision. 441 years after its inauguration in September 1565, the organ was ready to play again in one of the most suggestive Renaissance musical settings in the world.